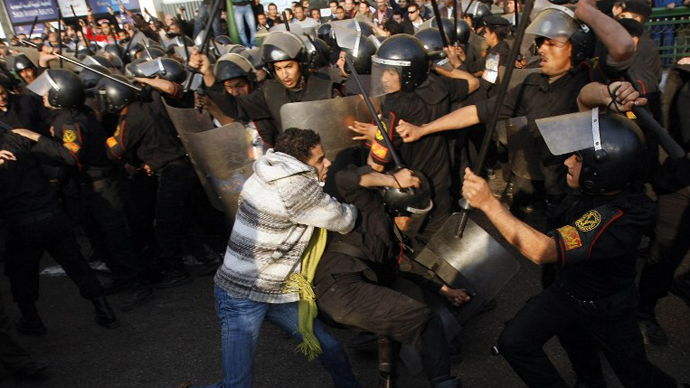 Hundreds of Egyptian protesters have encircled the Muslim Brotherhood headquarters in Cairo, attempting to break in. RT’s correspondent Bel Trew reports that protesters and Brotherhood supporters are clashing in Moqatam quarter around the HQ. Earlier an Al Arabiya correspondent reported that protesters had already broken into the Muslim Brotherhood complex guarded by police and Brotherhood members, but the news is yet to be confirmed. RT’s correspondent Bel Trew, who was at the scene, reported that hundreds were fighting each other with sticks, knives and stones. She reported hearing gunshots, but was unable to make out who was shooting at whom. Egypt’s ambulance service reported Saturday treating almost 200 people for injuries received in the clashes in several cities across the country. 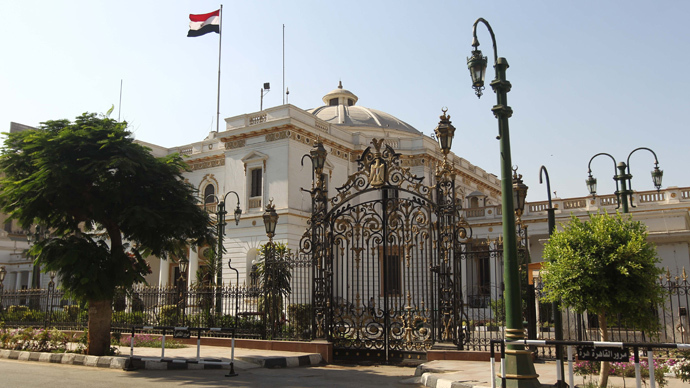 The majority, 127 people, suffered at the Cairo headquarters of the Brotherhood, while others were injured at smaller rallies elsewhere. 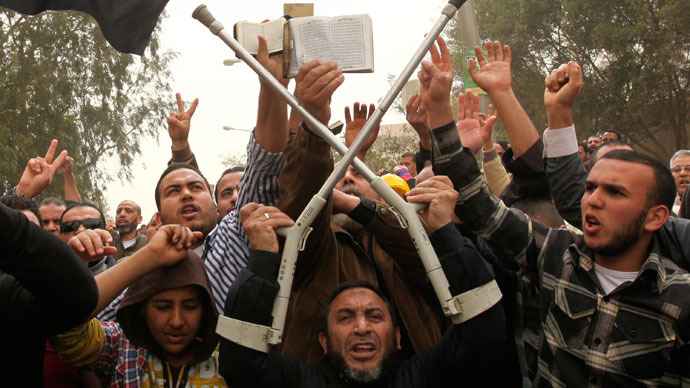 AP reports that there were about 3,000 anti-Muslim Brotherhood protesters rallying outside the group’s headquarters in Cairo. The number of defenders of the compound is estimated in the hundreds and only riot police making desperate attempts to separate the parties have prevented the compound from being stormed. Police did not interfere in the clashes, instead guarding the Muslim Brotherhood headquarters, and only fired tear gas at the protesters storming the headquarters. 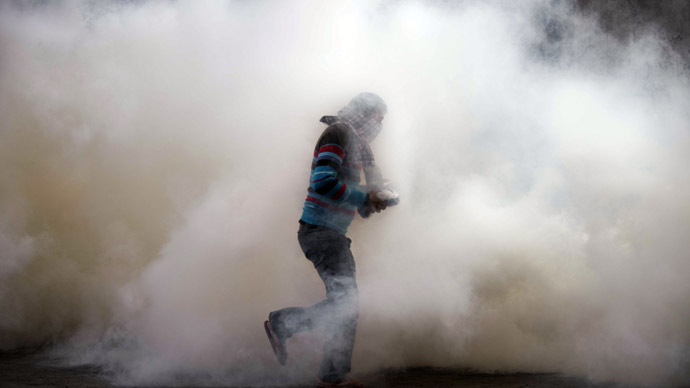 People were reportedly choking, vomiting and even fainting in clouds of tear gas. According to RT’s Bel Trew the situation in the Moqatam neighborhood was chaotic, as the front line between protesters and Brotherhood supporters constantly moved back and forth. Ambulances were taking away people with severe head injuries evacuated from the scuffle. Many people on both sides have been badly beaten. “Blood everywhere. Gunfire continues. Still can't find out where from,” Bel Trew tweeted. The crowd continued to push forward towards the Brotherhood building, making attempts to get over an outside wall of the compound secured with barbwire, Bel Trew reports. Protesters were shouting that they had had enough of the 'Muslim Brotherhood state', as they called it. They said enough is enough, they want a regime change as they do not want to be led by the Muslim Brotherhood any more. Trew tweeted she saw people soaked in blood and some protesters armed with slings and guns. On the way to the Muslim Brotherhood compound the crowd had attacked and smashed several vehicles belonging to the group. 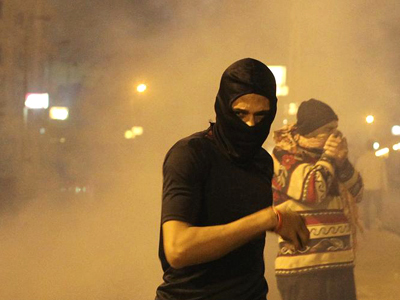 Clashes between civilian activists and Islamists in Egypt have not ceased for a week now. The warring parties have been throwing stones at each other and burning tires. 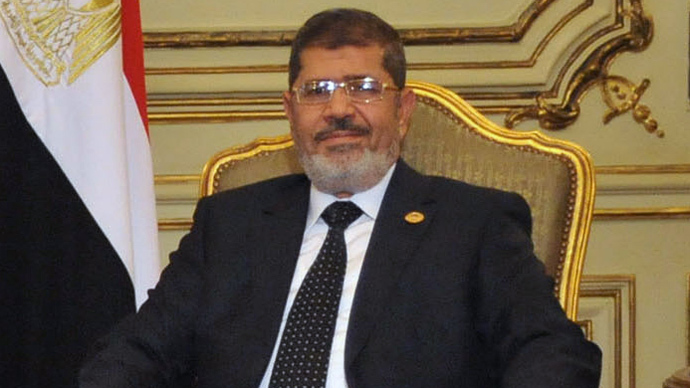 The anti-Islamist protesters are rallying against President Mohamed Morsi, the Islamists' successful candidate in last June's election. 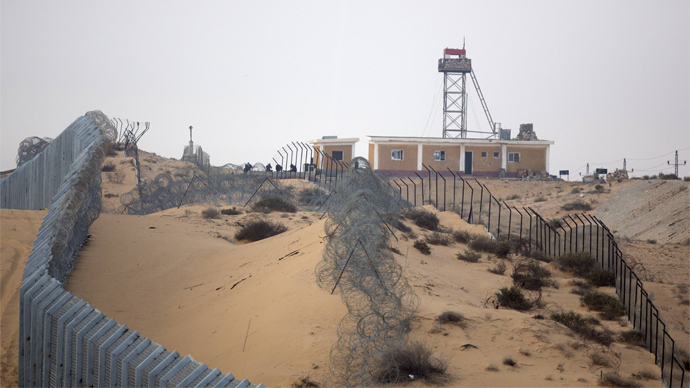 It had later been reported that another compound of the Muslim Brotherhoods in Egypt, this time in the northern coastal city of Alexandria, had been attacked. Protesters reportedly ransacked the office, taking anything valuable and throwing the rest out of the windows. 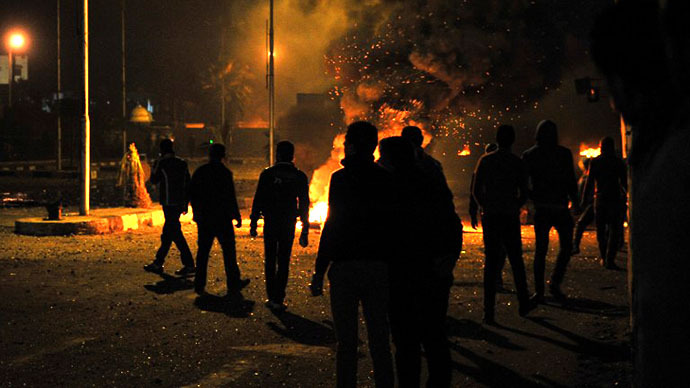 In the Nile Delta city of Mahalla protesters had torched a Muslim Brotherhood office, according to the MENA news agency. 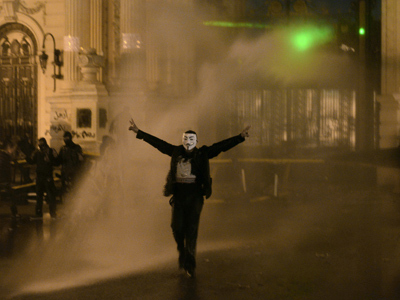 Demonstrators threw Molotov cocktails at the building until it caught fire, the news agency reports. The protests are just a visible part of a deeper problem of Egyptian society, opposition activist Mohamed Emara, told RT. “The people in charge and the president [Mohamed Morsi] have got a huge responsibility towards what is going on in Egypt, but on the other hand we have to be fair and recognize that the actual problem of the Egyptian society is violence that has been hiding scrapped under the carpet for years and years,” Emara said, adding that the violence does not actually serve the Egyptian revolution well. “We have to push very hard to continue with the revolution, which is to be correct and productive. We have to stick to that rule, otherwise we’re going to spend tens of years like this," he concluded. Ahmed Hawari, a spokesman for the National Salvation Front, told RT there is no chance of a dialogue now that the Muslim Brotherhood is mobilizing militias against demonstrators. He explained that protests in Cairo were triggered by the images of a peaceful female protestor being beaten as she vandalized a government building with the names of those who had been killed in previous protests.